Buying a house can get downright competitive these days. Nationally, the demand for houses has outstripped supply. Mortgage interest rates have remained very low. 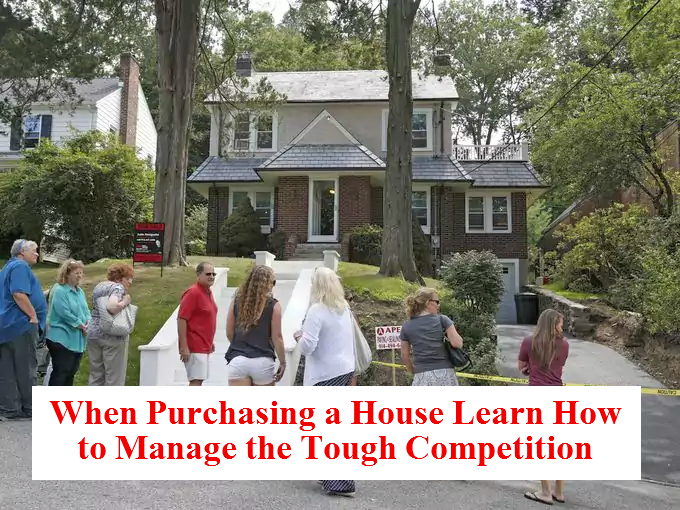 Learn How to Mange the Tough Competition when buying a house. NSH Mortgage has the knowledge to help Floridians stay in their budget when bidding on a home. Household incomes are on the rise. And prospective purchasers are getting off the fence and increasingly committing to a property of their own. Consequently, would-be consumers must prepare to act fast and pursue effective tactics to win their desired dwelling. Sellers on these top ends are reluctant to sell, as they are still trying to recoup the perceived value they lost throughout that time. This, in turn, stalls the move-up market, which creates a tight market for first-time home buyers.” As a result, home seekers need to be ready to complete hurdles along their path to home ownership. Rebecca Mason, executive vice president and head of sales for OneTitle National Guaranty located in New York City, agrees. “Prospective buyers should use the knowledge of their entire team including: their real estate agents, their real estate attorneys, and their mortgage providers, to educate themselves on the state of the market in which they will be participating,” says Mason. Jim Esposito, Realtor with Intercoastal Realty in Fort Lauderdale, explains that development is crucial if you want to out maneuver other buyers vying for the same property. “You need to comprehend what houses are priced at in the neighborhood you are shopping in so that you can recognize a good deal when it hits the market,” says Esposito, adding that it is crucial to inspect the list of comparable properties your agent can provide thoroughly. “In addition, get the financing process underway and get all the paperwork together that your lender needs.” This also means acquiring a pre-approval letter from your lender that you can present to the buyer that demonstrates your sincerity. “By getting pre-approved, you will also know your buying power and how much you can increase your offer price to remain within your payment budget and loan approval,” Wes Kleckley, branch manager for San Antonio, Texas-based InterLinc Mortgage Services, LLC, advises. Jacquet advises setting a hard limit on what you are going to pay, and if the price escalates beyond that amount, “Be prepared to walk away,” he says. Be aware that if you want to purchase a property for a higher price than its appraised value, you will have to cover the difference out of your own pocket, says Collin Bond, licensed associate real estate broker with Douglas Elliman in New York City. For instance, if you are buying a house for $200,000 with five percent down ($10,000), and it appraises for $190,000, you must negotiate a lower price or come up with an extra $10,000 down payment. When it’s time to make an offer, make it a serious one after consulting with your agent. “If you try to snowball your bid, you might alienate the seller. Lowballing only succeeds when the properties have been sitting there for a while,” says Esposito. If you get caught up in a bidding war, progress cautiously. “You can get so caught up in the moment and in beating the other bid that, suddenly when you have been notified that you have won the bid, a bad case of buyer’s regret hits and you have to back out of the deal,” Mason explains. “One of the most underrated aspects of the negotiation process is the progress at which the negotiation takes place. “Ask how the seller is maintaining the multiple bid process – is it individually with each bid? Is there a deadline for everyone to submit their highest and best offer? Is there an expected duration by which the seller will make a decision?” By setting out in advance what your expectations are, “this can be a much less complex period,” says Mason. Additionally, if you are going up against an all-cash buyer competitor, you can opt to waive your mortgage contingency to sweeten your offer to the seller. “Mortgage contingencies are common in a contract of sale and state that, if the client is turned down for financing, they are able to have their deposit returned,” Bond says.